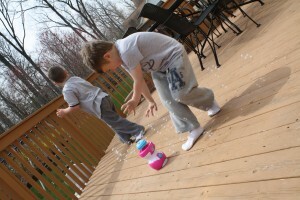 Cole had fun today playing with his little friend in the nice weather and this Blastos Bubble Twister from LittleKidsInc.com. It’s $13.99 and comes with a big bottle of bubble solution. Three AA batteries are needed. 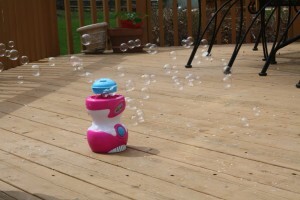 Hooray for warm weather and getting the kids outside and playing with bubbles. I love this time of year.